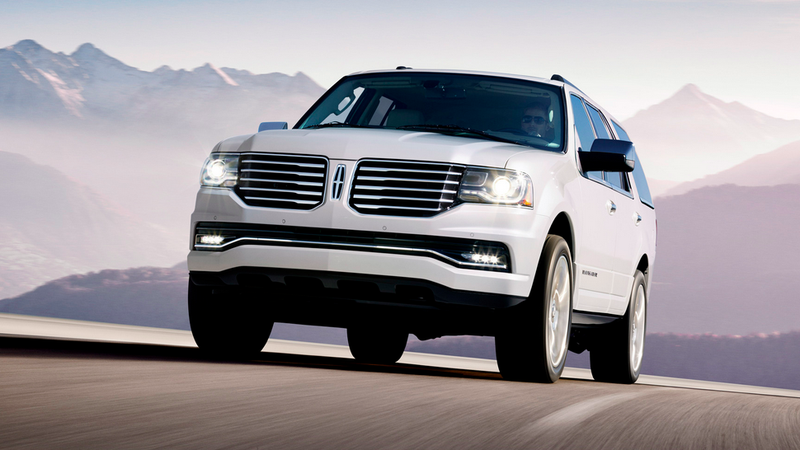 I'm not sure if you're aware of this, but Lincoln recently released a new Navigator. Yes, it's true! This was a few weeks ago, presumably at an annual convention of airport limousine drivers. Could you imagine the spectacle? The drivers are assembled, they're in a quiet room, the lights are dim, there's an air of secrecy, and then BAM!!!! Lincoln pulls the cover off the new Navigator, but nobody notices because they're all too busy speaking in foreign languages on their ear-mounted Bluetooths. No, I'm just kidding. The Navigator isn't only purchased by airport limo companies. It also enjoys a long tradition of everlasting popularity among several other wildly diverse groups, including Ford employees, spouses of Ford employees, parents of Ford employees, etc. So Lincoln really has the market cornered on family, friends, and hired help. But I think this is a real problem, because the Navigator really should be more popular than it is. After all, we live in America, where we all want large, capable, high-riding SUVs just in case we see a light dusting of snow, at which point we abandon them on the interstate. At least, this is how things are going in Atlanta, though I must say that I — as a proud Atlanta resident — had no problems in my own SUV, and on another note, I really hope all those cold, stranded people I drove past eventually found food and shelter. Anyway, back to the Navigator. The new one is supposed to really change things. It's supposed to be a member of the "Lincoln Motor Company" family, the same reimagined Lincoln that gave us a series of well-made, opulent Ford derivatives that bear a striking resemblance to sea creatures. It's supposed to be exciting. It's supposed to be special. It's supposed to be wonderful. The only problem? It isn't. Now, before I get into this, I want to go on record saying that I really believe in Lincoln's future. In fact, I already am on record saying this. I announced several months ago that I really think Lincoln can turn things around, and I came up with an excellent argument, and I laid out all these great reasons, and I was all excited to post it, and then the commenters basically told me I'm a weenie-head. And now, I'm starting to think they're right. To explain why I'm changing my tune, I turn to Cadillac. You know Cadillac. I know Cadillac. That guy who bought my CTS-V Wagon especially knows Cadillac, since the wreath and crest emblem is now embedded in his forehead. In the Cadillac world, the flagship model is a large, V8-powered, hyper-masculine SUV known as the Escalade. Say what you will about the Escalade, but it's freaking cool, and everyone knows it. Rappers have them. Actors have them. Sports stars have them. And they're all clamoring for the new one, even though this thing has been out, in some form or another, for 15 years! Compare this to, say, the PT Cruiser, which was cool for about nine months until everybody's grandmother bought one. So Cadillac really knows the market. And frankly, it's not that hard to figure out. Take a big SUV. Make it look cool. Give it a large engine. Film some exciting ads. Sell it to a few celebrities with a steep discount on the condition that they'll use it every time they're at a movie premiere, restaurant opening, drive-by shooting, etc. And boom! You've got yourself a winner. So why is the new Navigator such a loser? Well, let's see. I could bring up styling, and talk about how the "new" Navigator looks just like the "old" Navigator except now it has a) those annoying tail lights from the Dodge Durango, and b) nostrils. Or I could mention the interior, and specifically cite the fact that Lincoln's definition of "luxury" appears to be taking buttons from the Ford Expedition and painting them silver instead of black. But I'm not going to do either of those things, because that would be too easy. Instead, I'm going to simply call out Lincoln for missing the point. You see, I happen to like the MKZ, which is that streamlined midsize sedan based on the Ford Fusion. And I'm very positive about the upcoming MKC, which is a small crossover based on the Escape. But neither of those vehicles address Lincoln's biggest problem: its image. To improve its image, Lincoln will need style. It'll need muscle. It'll need a full-size SUV that gives people something to aspire to and dream about — just like the Escalade. But if the "new" Navigator is any indication, I'm not entirely sure whether Lincoln understands all that. Instead, it seems they're content with a warmed-over version of today's model — an SUV that doesn't bring anything new, or exciting, or different to the table. Coming soon to your local airport.